Everyone has food blind spots; things they don’t go near or never cook, for reasons of fear, indifference, ignorance or simple bloody-mindedness. For me until about 18 months ago, gnocchi was on my list of blind spots, along with poached eggs, which I avoid cooking if I possibly can (I’m inexplicably bad at it) and puff pastry, which it’s possible I have never ever made. 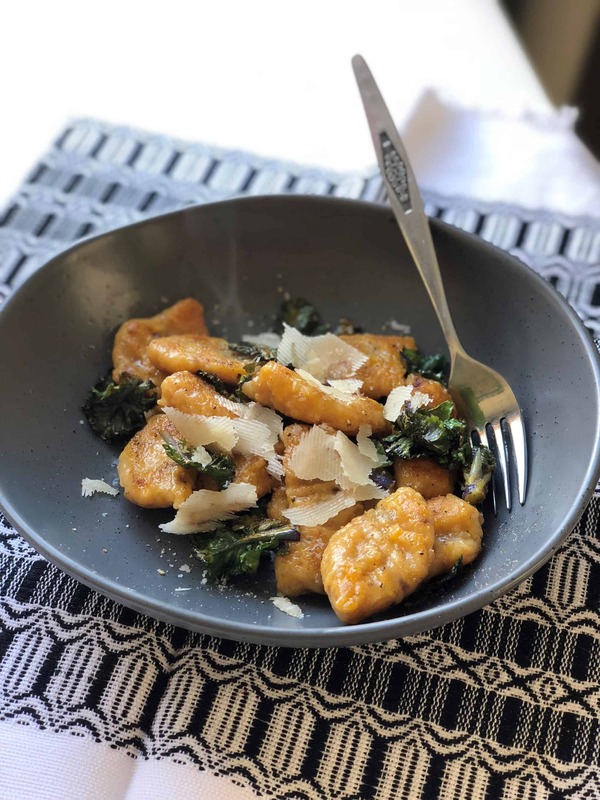 Gnocchi – one of the great potato dishes of the world – was something I’d never made either, even though I always enjoyed eating it. I’d never made it because I had the impression it was difficult and fiddly, and prone to being stodgy, gummy and unappealing when not made well. Certainly I’ve eaten some pretty poor gnocchi in restaurants, which leads me to never order it unless I know the chefs know what they are doing. But it turns out that making your own gnocchi is really not that difficult. You could say it’s a little bit fiddly, but it’s less so than making your own pasta, and the hands-on work is less, given there’s no rolling. And a plate of perfectly-made gnocchi fresh from the pan is a beautiful thing to eat. Lovely little pillows of potato-ey goodness with a mild, earthy flavour that marries well with all manner of sauces from the fresh and light tomato-based to creamy, gooey, cheesy decadence. There’s also something hugely luxurious about eating a dish of gnocchi bathed in nothing but sage-scented, lightly browned butter and a drift of grated parmesan and black pepper. I’m making myself hungry writing this, and I’ve just had breakfast. The first, of course, is using the right spud, and cooking it right. We want a floury potato here: Agria or similar. To keep the potato as dry and light as possible, baking it is the way to go; just stab a couple of times with a fork and roast in a hot oven until soft and collapsing. Then squeeze out that soft and fluffy flesh and mash, or, if you’re after super-light pillows, put through a potato ricer. Let it cool until you can handle it (or roast your spuds ahead of time). The next trick is to use as little flour as possible – this will stop the gnocchi getting doughy and heavy. It’s difficult to give exact ratios; I’ve learned to do it a little bit by feel, gradually adding the flour from a sifter until it’s just enough to form a soft dough that you can handle without it being sticky. This may also depend on whether or not you use egg, egg yolk or no egg. It takes a little bit of experimenting, which is totally worth it if you ask me. Once you’ve got your technique down, there will be no stopping you with your gnocchi. You can season with different flavours; add herbs; add spinach (although watch the water – squeeze it out well) or try potato mixed with other veges. Here’s a recipe to get you started. Preheat oven to 200C. Pierce potatoes and place on a backing tray. Roast for about an hour, or until soft. Remove from oven and squeeze flesh into a bowl and mash, or use a potato ricer and stir with a fork. Season. Set aside to cool. To make sauce, heat half the olive oil in a large pan over a medium heat. Add onions and garlic and cook for 2 minutes. Add mushrooms and cook, stirring, for 5 minutes, until mushrooms are browned and softened. Add tomatoes, wine and sugar. Bring to a simmer and cook for 20 minutes, until liquid has reduced. While sauce is simmering, make gnocchi. Bring a large pot of salted water to the boil. Sift in half the flour to the potato and stir to combine. Add egg and salt and stir, then add more flour, just until the mixture forms a dough you can handle. Place dough on a floured board and divide in two. Don’t knead too much or the gnocchi will be heavy and gummy. Sprinkle with more flour if needed. Roll dough into long sausages. Cut each sausage into bite-sized pieces. Optional step: roll gnocchi pieces over the tines of a fork to create ridges. Add gnocchi pieces to boiling water. Cook until they float to the top of the pot; then leave for one more minute. Remove with strainer or slotted spoon. Add spinach or rocket to sauce mixture just before serving, to wilt. Serve gnocchi with sauce, sprinkled with fresh thyme and parmesan.